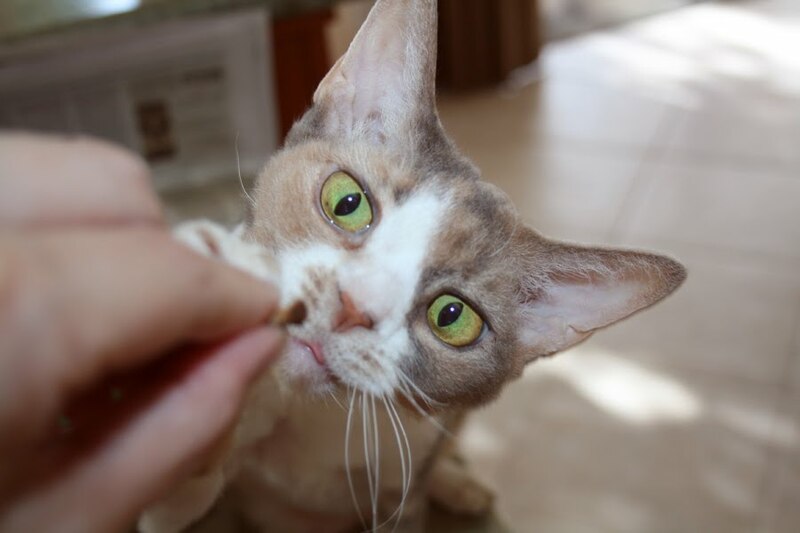 Daisy the Curly Cat: More Treat Faces! Click to visit my shop! ps: You cannot use this button to fix your clothing. Sorry. Harley and I both LOVE treats. This is my very best concentration expression. Can you see my tongue? When your tongue sticks out, it proves your are concentrating hard. Harley is very enthusiastic about treats. He cannot model for treats, like me, because he goes too wild and cannot sit still. Even though we get treats almost every day! My mum says she would give those faces a squillion treats if you lived with us. Yes, the tongue is proof of concentration... Great pictures. Our dad laughs at our mum because she sticks her tongue out a little bit when she is concentrating too. It looks like Harley wants to eat your mum's fingers as well as the treats. Harley and I take treats the very same way! Adorable!! You two have the cutest treat faces I've ever seen! I'm like Harley! I can't stand still when there are treats involved. Those are great treat faces...we go crazy for treats too!! I'm like Harley, too! I get all excited about treats!!! We love both of their eyes. Harley always looks so wild and I guess that is because he is wild. Daisy, your tongue is too cute. It is ready for that treat. Boys, sheesh! They don't have very good manners. My mommy agrees with Poppy's mommy. With those faces and with Harley holding my hand like that...treats every time they ask. Don't bite the hand that's feeding you, Harley! :) We do so love your googly eyes. I can see you want the treat very much!!! You two have the cutest treat faces! Those are excellent treat faces. Our Mom is impressed with Harley using soft paws when he gets his treat. Our claws come out all the time when we get our treats. We're mostly like Harley!! Sniffie is more like you. What cute faces! What kind of treats do you like the best??? Girls and boys are soooo different! 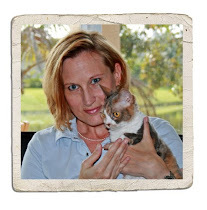 Coco is all boy, eager and wild, but then she was 1 girl in a litter of 3 brothers and research shows that she was influenced by male hormones in utero...really! yeah, but treats are TREATS!!! there's nothing better! You two are just too cute! You both have big eyes looking at those treats - although Harley's eyes do look a little crazy as well. Harley, is your Mom gonna pinch your tonsils? You sure made sure that treat got in your belleh! Our Mommy does the tongue thing too when she's thinking. She says it's a sign of--get this--genius! Harley is just like Alfie ~ he puts a paw up to sort of guide the treat into his mouth ~ and he is a bit wild abowt them, even though we get them every day too. I am like you and are well behaved and patient ~ although mom says that sumtimes I inhale treats instead of crunching them nicely. MOL! Your mom has muy much self-control, Miss Daisy-face! My mom would not be able to resist giving you treats just to see your wee tongue jut between your teeth in intense concentration. Personally, I roll more Harley's way! The two of you have the most gorgeous eyes! Our mom would be dishing out treats ALL day with them cute faces! We get treats 1 MAYBE 2 times a day. Daisy, cute as ever :) Harley, that's how I look when I see cake with frosting!!!! what cute photos! i like how it compares you and harley. you are such a lady, politely reaching for the treat. and harley is all "get in my belleh!". Daisy, I have that same look when I want treats and like Harley, I cannot sit still. OUr Meowm just puts our treat in our dish.....this way we can eat it when we want to. You two look very cute getting your treats! Mabel sits near her treats jar and stares and stares and stares at me until I open the jar! I see your tongue, you are concentrating hard aren't you? Harley looks likes he's trying to swallow your mom's finger...lol He must not have been concentrating like you were. 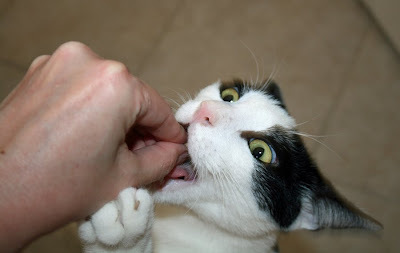 Your person is very very brave to stick her fingers into Herley's mouf like that! He must be a really, really, really trustworthy kitteh! We sometimes are good with treats, othertimes we get a little silly crazy with them. Treats every cat deserves a treat. ok we all do. Mom does that tongue thing when she concentrates too... it's pretty funny. I guess I am like Harley.... never get enough treats! I adore your treat faces! They are so very passionate and speak volumes without you saying anything at all. I can also see that your claws are slightly extended. You wouldn't want that treat hand to move before you got it, would you? Oh, Harley, you are so silly! And Daisy you are so pretty when asking for treats. Awwww!!!!! What cool treat faces!! You two are the cutest ever!! Clemmie is home and recuperating!! She smells funny!! Thanks for your purrrrs! Hmmmm ... I thinks She should takes pictures of mine treat faces for mine blog! That is a good idea you guys had. I hopes you will not minds if I borrows it. I is getting lots more treats now. Some of them is so I takes mine yucky pills good but some is just because. I likes treats. Yeah, your brother is such a spaz. Wow, that's concentration on your face Daisy, for sure! Lookit your focus! And Harley, love the ears pulled back! Wild man! 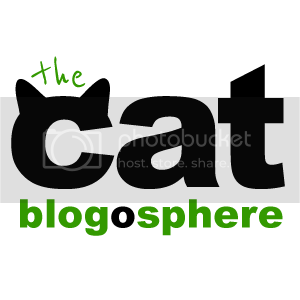 Visit the Cat Blogosphere daily! Hi everybuddy! 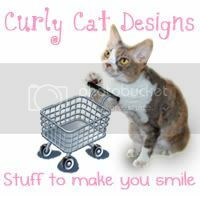 I am a dilute calico Devon Rex cat. Thanks for stopping by my curly world. I hope you have fun!